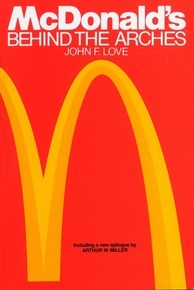 There have been two publications of "Behind the Arches". The first was a hardcover published in 1986. The second is a softcover published in 1995. I'm sure there are used hardcovers out there but the softcover (new and near new) appears to widely available online. I have both and the two versions are identical. Except - the 1995 reprint has a 21-page epilogue at the end that was written by a different writer. I've always been suspicious that the writing of the epilogue had a heavy Oak Brook influence but the original book by John Love is intact in both printings. We need stronger Owner/Operator representation. Make an exodus plan quickly if you are a small McDonald’s franchisee. They are undervaluing stores any way that they can. I will tell you a story I heard yesterday but I don't know if it is true. I was told that MCD refused to approve a sale between two operators. The reason MCD gave was that the selling price was too high and they were not going to exercise their right of first refusal. They went on to say that the buyer could not cash flow at that selling price and they encouraged the seller to lower his price. After a few months the seller agreed to lower his price to insure the buyer could cash flow. The buyer submitted a contract for the lower price and then MCD exercised their right of first refusal and purchased the store. If true, and I don't know that it is, we are in a different ball game. In the past if MCD was concerned about the buyer paying too much they would approve the sale subject to the buyer taking a larger equity position with non-encumbered cash.